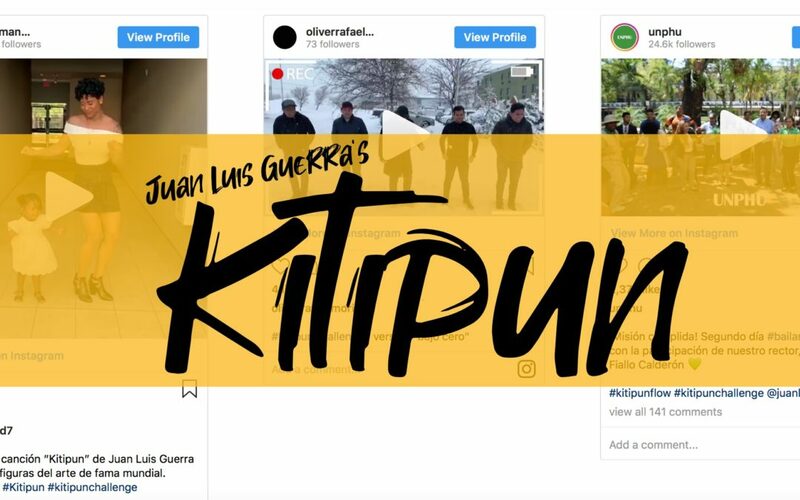 Have you heard "Kitipun" yet? If not, you need to! The first single from Juan Luis Guerra's new album was just released on April 5 and it's making major waves. The bachata beat is super catchy, the lyrics are sweet, and the visuals make it easy to understand what he's saying (PERFECT for language classes). Watch it now... and then keep reading! Juan posted the video below challenging others to DANCE and the internet is responding. Celebs like Zoe Saldana, Juanes, Ricky Martin, the crew from Univision, (and many more) are posting their versions of the JLG bachata shuffle. Sound familiar? Your students will definitely remember the #InMyFeelings Challenge from 2018 and the viral videos that followed. This makes for great authentic input for us to read, watch and listen to in class! #KitipunChallenge ; versión "bajo cero"
Have them try the challenge as a brain break that gets them moving and has a real-life cultural connection. Bonus! Here's a "backdrop" to project while they "perform." Ahh... Don't these lyrics just make you smile?!?. Trending topics = connections to real like and native speakers! When something is trending, we believe it's worth talking about it in class. These are those relevant moments that they will remember! We hope these ideas get them talking and engaged and . Extension Ideas: Learn more about Juan Luis Guerra, his music, Bachata, and related Bachata artists. ¡Gracias, Megan! ¡Me encanta! ¡Perfecto para baile viernes mañana y después de la locura de marzo! Me encanta gracias por todo. Awesome. I just did bachata en fukuoka last week. haha, so creative! That’s a joke even a native speaker would laugh at! Thanks for sharing, Gregory!